I first met “Steady” at Cable Gap Shelter, south of Fontana Dam as it delivers the Appalachian Trail (AT) into the Great Smoky Mountain National Park. She was hiking (in five toes!) with “Hap,” a gray haired gentleman who, like me, missed his wife. Days later, on a soggy, foggy trail I asked her the lame but inevitable question: How’d you get your trail name? She said the name reflected her hiking gait and attitude. 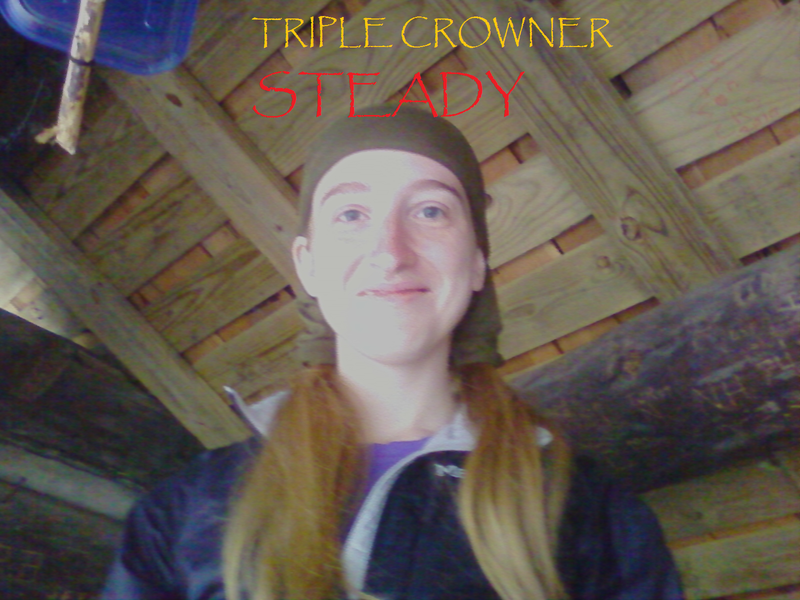 She was so steady she hiked the Appalachian Trail all the way to Katahdin in 2011. In 2012 she thru hiked the Pacific Crest Trail (PCT). In 2013 she thru hiked the Continental Divide Trail (CDT). I am proud to know someone who has completed the Triple Crown of American long distance hiking. Steady has hiked other American and European trails, and as I write this, she is somewhere out west hiking! It was an honor and a privilege when this normally private and introverted super-hiker agreed to a formal interview for my thetrek.co blog. I do feel that hiking is changing, but I only blame the recent movies and records for a small portion of . These things might draw interest from some people that have never considered hiking, but if other conditions weren’t right, the vast majority would never show up at the trail. I certainly don’t feel record attempts are going to draw anyone in that’s not already in the community, and having seen both Wild and A Walk in the Woods I don’t really feel they screamed “come hike, it’s awesome!” either. I don’t feel having a few sponsors is really contributing much to commercialism either. We already carry a bunch of gear plastered with logos and word spreads rapidly about good and bad hiker products. I think access to information in general is what is changing hiking. We have increasingly lighter gear that makes hiking more of a reality for more people. Internet resources like forums, blogs, Facebook, and especially YouTube allow access to enough information to assuage the fears of many and ensure that many more show up at least reasonably prepared. Smartphones/tablets/SPOT type devices ensure that you’ll never be isolated from home and advice unless you want to be. A changing economy leaves more people with work they don’t feel guilty just walking away from. The change has been slowly happening over the last several years. I think it’s becoming more and more difficult to have the type of hiking experience that existed even 5-10 years ago. I want to be happy with the influx of newbies. Hiking has the power to change lives, and I want others to have that chance. I love the chance to interact with a diverse group of people and gain insights into their lives. I think such chances create better people in general. But trails packed beyond capacity aren’t enjoyable for anyone. Certainly more experienced hikers can find a more deserted trail that fits their style, there are plenty of scarcely used trails and routes. However, most of those are really best attempted by those with a certain skill set. The AT and to a lesser extent the PCT, has always been a good “starter” trail, with lots of support and room to learn. With the increasing strain on trail resources and local communities, AT hikers are already less loved than they used to be. I’m sad for the loss of an “era”. Certainly SOBO hikes and flip flops can help to some extent, but it’s never going to be quite the same. The problem is starting on the AT, but is going to rapidly spread to other trails. A certain percentage of successful hikers are always going to want another hike, and that increases the PCT, the CDT, and slowly even some of the shorter trails. Again, that’s a great thing, in a sense. But an influx of people in an environment that’s not prepared for them is going to create problems. I’m not sure what the solution here is. I hate the idea of a quota type system, but something has to be done. Perhaps hiking is becoming too logistically easy. Certainly hiking several thousand miles is always going to be physically hard, but I almost think we’ve reached the point where there is too much support, too much trail magic, too much expectation that being a thru hiker makes you entitled to special treatment. To me a good chunk of the fun is in discovery. Studying my route in advance, not quite knowing exactly what to expect each day, discovering a great town restaurant/hostel/angel on my own. As much as I love my app that takes all the “stress” and guesswork out of things, I also hate it. I love reliving the trail on YouTube, but I also don’t really want to watch the entire trail in advance, it’s not really magical anymore when you know there’s nearly always “magic” at mile X, or the hostel at mile Y is wonderful, or you’ve already seen the amazing view at mile Z.
I think we need to create more awareness of other trails. Maybe newbies might decide that a shorter more local trail is a better fit for them, if they were only aware. There’s a certain “WOW” factor in a thru hike of the AT, but it’s certainly not the only or best way of having such a feeling. Maybe a “find my perfect trail” sort of website that makes finding information for lesser trails easy could help to spread out some of the rush of new hikers. Beyond that I think we definitely need some better education. Not on how to hike and gear, but on how to be a responsible trail user. Leave no trace principles, being respectful of other hikers and towns, emphasis on the fact that having fun is great, but this isn’t a mobile party Baxter and other regulations. Maybe the ATC can issue/require permits(even if unlimited) and make said video required viewing, kind of like the videos you watch in a national park before you get a backcountry permit. Hikers also need to speak up when they see others misbehaving. It’s no fun to be the one ruining the party, or the lecturing “adult,” but as a community we are the best resource for policing ourselves. The bad behavior of a few has lasting effects for everyone and it’s better to be hated by a “bad” or uninformed hiker or two than to allow the entire community to suffer. The mantra is HYOH, but that can only apply as long as “your hike” isn’t hurting others or the trail itself. I certainly agree with most of Steady’s views on the state of long distance hiking. The AT already faces serious challenges from overcrowding. Apparently many similar issues are shared by the PCT. Personally, I could do my part to “spread out” hikers by plugging Kentucky’s Sheltowee Trace through the Daniel Boone National Forest. I have hiked small sections of the Trace and a thru hike of it would constitute a proverbial bucket list item for me. Steady would certainly be one person I’d love to hike it with, if I could keep up with her! 2016 is already proving itself a record setting year for volume on the Appalachian Trail, as anecdotal evidence reveals itself on social media. Hikers have opinions about the trail. Hikers talk– sometimes in public, but there are many more private conversations. I listen to many people, but I don’t agree with them all. There are few people I trust merely by instinct, but Steady is one of those people. She also has an impressive list of accomplishments as a hiker without the ego to go with it. Having hiked with her on the AT in 2011 and 2014, I know how she operates on the trail: Light weight, whisper quiet, disciplined with a spartan toughness, smart, and always following Leave No Trace ethics. I can think of no better paragon of long distance hiking than Steady. So when she has something to say about the trail, I listen carefully. Wow, a lot of wisdom out of Steady. Good for her. I’ve hiked a chunk of the AT, but not the whole trail. I had planned to go back and hike more chunks, but I’m less interested in the AT now, due to crowding and overuse. My next overnight hike will be on something else, to give the AT a break and let me explore new territory. I think she’s right on the money regarding why the trail is far more popular now — access to info. And, yes, “A Walk in the Woods” can’t really be seen as an endorsement of the outdoor life. Those of us who are lucky enough to have spent time on the AT in past decades (I started section hiking the AT in 1976) I look back – as Steady does – with chagrin. The Trail experience years ago was vastly different than today, and dare I say, better. I grow tired of correcting bad behavior, subtly suggesting alternative techniques, and finally just being blunt and calling out a miscreant. The crowds do not enhance the Trail experience, but they certainly do change it, for the worse in many cases. I second her suggestion that newbies try shorter trails – Pinhotti, Mountain to Sea, Superior Hiking Trail, Long Trail, Ouachita Trail – that offer a similar experience but less pressure and a greater chance of success. I do believe the NPS/ATC are going to have to institute a mandatory permit system for the AT to limit the impact of greater numbers of hikers; perhaps even dramatically increase the number of hall monitors – Ridge Runners – to control the bad behavior of entitled hikers. Otherwise our National Treasure is going to be loved to death, and become no more wild than inner cities.